Pixelpop collects and stores emails out-of-the-box, but to make things even easier, it also integrates with powerful email marketing tools to help you build your mailing lists. These services are: Conversio (an all-in-one marketing dashboard), MailChimp (the world's leading email marketing platform), Klaviyo, and Constant Contact. The first step to integrating your popups with your email marketing platform is choosing one and getting set up with an account. We won't try to sway you one way or the other—we'll let them take care of that—but we will say they're all excellent choices. Once you're a happy Conversio, MailChimp, Klaviyo, or Constant Contact customer, you're ready to create some lists and sync some popups. In this article, we'll go over the steps to creating a list, then how to integrate with your email marketing service! Then be sure to check out our blog post on creating meaningful and effective email campaigns. Feel free to jump ahead to an article if you need to! The first thing you need to do is create a list in your email marketing service of choice. You might even want to create multiple if you're going to be collecting emails for different purposes (though keep in mind that most email marketing services also allow you to segment your mailing lists). For a complete walkthrough of the list creation process in Mailchimp, see our documentation on How to Integrate Your Popups with MailChimp (and here for Conversio). Skip down to the section below for Klaviyo or Constant Contact. To sync your emails with an email marketing service, you'll first need to create an Email Signup popup. It's super easy, but if you need a little extra help, you'll find it in our article dedicated to creating a popup. The most important thing is that you select Email Signup from this screen, then follow the prompts until it's published. You can connect your popup to MailChimp either from your Pixelpop dashboard or within the popup editor. After you’ve created an Email Signup popup, you can connect it to a MailChimp list by clicking the purple "Select mailing list" button right below your popup. This button will appear if your popup has not yet been integrated with MailChimp—it doesn’t matter if it’s published or not. Once you’ve clicked it, an Email Collection window will pop up to customize the connection. 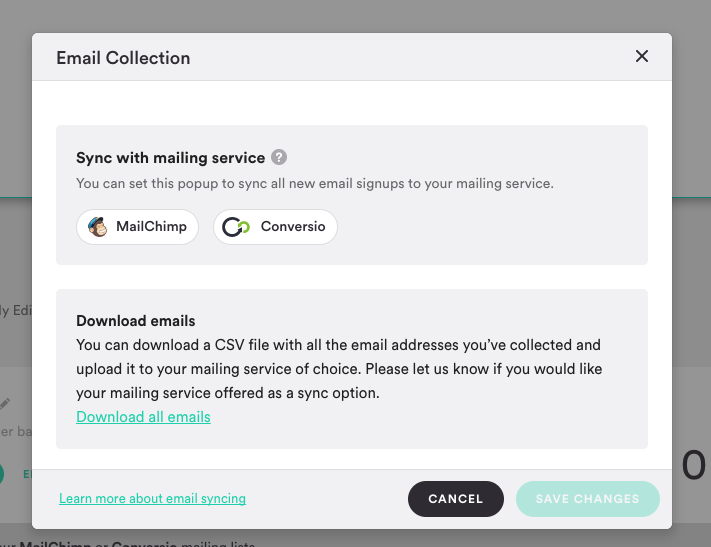 Choose MailChimp from the Sync with mailing service section. This will open up another window where you'll log in and give Pixelpop access to your account. Next, you'll be prompted to select a Mailing list from the dropdown and specify whether or not you want to Require double opt-in for new signups. If activated, this will require recipients to opt-in to your mailing list via a confirmation email from MailChimp before they are subscribed to your list. Note that this may be required by law in your country. Click Save changes and you're done! Now, anyone who gives you their email via this popup will automatically be added to this list in MailChimp. Be sure to check out our blog post on creating meaningful and effective email campaigns. Note: Emails may take up to 15 minutes to sync to your mailing service. Enabling double opt-in may also result in your email list numbers not matching your Pixelpop email collection metrics. If you want to change the list your emails are collected to, or disconnect from your mailing service at any time, simply click the Emails link next to your newsletter. If you’re creating a new popup or editing an existing Email Signup popup, you can enable email syncing from within the editor. Under Options, click the green Connect link under the Sync emails heading at the top. This brings up the same Email Collection dialog as connecting through the dashboard. Follow the steps above to toggle the connection on, choose MailChimp, select your list, and enable or disable double opt-in authorization. Click the green Save changes button. To edit your connection preferences at any time, click on the green Emails link from your dashboard. 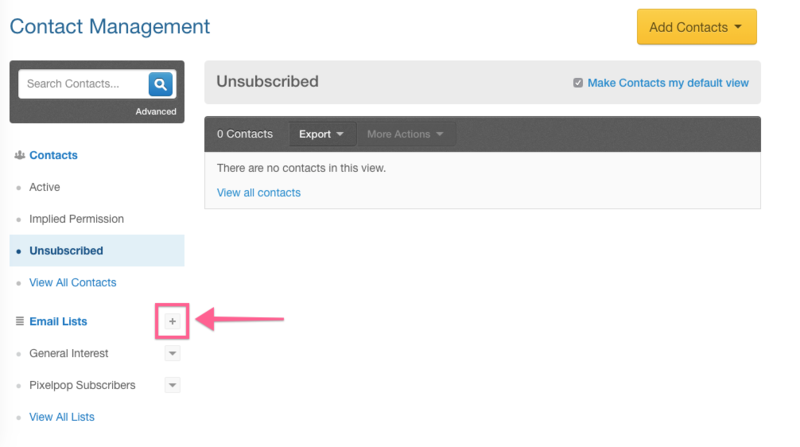 You can also manage your email syncing from the Account Settings on your Account page. Simply click the Connect link under MailChimp and log in to your account. Note that with this option you will still have to go to your dashboard or popup editor to customize the mailing list your emails are sent to. Be sure to check out our blog post on creating meaningful and effective email campaigns. Conversio is an all-in-one-marketing dashboard that allows merchants to automate their marketing and transactional emails, plus a whole bunch of other stuff including product recommendations, customer reviews, and search functionality. Pixelpop integrates with Conversio's newsletter function, giving merchants the ability to automatically sync email addresses collected by their popups with customer lists in Conversio. To get started, all you'll need is a Pixelpop account and access to a Conversio account with newsletter functionality. Log in to Conversio (or create an account here) and click Newsletters>Customer Lists from the left sidebar menu. If you already have a list you’d like to use, great! You can skip to Step Two. If not, click the green Create New Customer List button to the right and give your list a name. On the next screen, you'll can either add emails manually (by clicking Add email) or import subscribers from a list (Import email list). Once you've connected Pixelpop, emails will be synced automatically. Log in to your Pixelpop account from your Apps page. You can either connect Conversio to an existing Email Signup popup, or click the purple New Popup button to create and connect to a new one. To create a new popup, follow the instructions here, choosing Email Signup from the New Popup screen. After you’ve created an Email Signup popup, you can connect it to a mailing list by clicking the purple Select mailing list button right below your popup. This button will appear if your popup has not yet been integrated with a mailing list—it doesn’t matter if it’s published or not. Once you’ve clicked it, an Email Collection window will pop up to help you customize the connection. Choose Conversio from the Sync with mailing service section. This will prompt you to enter an API Key, which you'll find in your Conversio Settings (Account>Settings in the sidebar). Under the Settings header, it will say something like: "Your company, Pixel Union, uses this API Key: #########" (only it will be a whole lot longer and uglier). Copy and paste this key into Pixelpop and hit the green Authenticate button. After a few seconds of "authenticating," you will be prompted to select your Mailing list from the dropdown. Click Save changes and you're done! Now, anyone who gives you their email via this popup will automatically be added to this list in Conversio. Be sure to check out our blog post on creating meaningful and effective email campaigns. This brings up the same Email Collection dialogue as connecting through the dashboard. Follow the steps above to toggle the connection on, choose Conversio, authenticate (if you haven't already), and select your list. Click the green Save changes button. To edit your connection preferences at any time, click on the green Emails link from your dashboard. Click the green Connect link below "Conversio" and enter your API Key, which you'll find in your Conversio Settings (Account>Settings in the sidebar). Under the Settings header, it will say something like: "Your company, Pixel Union, uses this API Key: #########." Copy and paste this key into the API Key field and hit Authenticate. After creating your newsletter signup, you can connect to Klaviyo from the dashboard. You can click the ‘Select Mailing List’ button to connect to your list! Once you have the key, place it in box provided, and click ‘Authenticate’. Once authenticated, you’ll be able to select the mailing list you wish to connect to. Then you’re off to the races! Be sure to check out our blog post on creating meaningful and effective email campaigns. Here is a step by step guide on how to set up a list in your Constant Contact account and sync it with a Pixelpop email popup! First, you’ll want to create a new blank Email List in your Constant Contact account, where all of your new Pixelpop email subscribers will be added to. This will prompt you to create a new list for all of your shiny new Pixelpop subscribers. Give it a memorable title — you’ll use that later on. Your list will be left blank so that your Pixelpop subscribers are added to it! Once you’ve finished creating your new list, go back to your Pixelpop dashboard from your Shopify account. Now you are ready to set up your connect your list to an email popup. The email popup will capture new email addresses, which will then be sent to your new Constant Contact list. Click on “Create a popup” from your app dashboard (or on the “+ new popup” button). You’ll be taken to a new screen where you can choose from Pixelpop’s various features, but in this case, you’ll want to select “Email signup” to create a Newsletter sign up. This will open up the app’s style editor. Go ahead and style your Popup! On the final section of the editor (the “Orders” tab), you will see the option to Sync Emails. This is where you can select Constant Contact and choose your new list! That's it! You have now successfully created a subscriber list, set up a spiffy Pixelpop email popup, and are ready to hit publish. Get ready to see your subscribers appear in your Constant Contact account. Be sure to check out our blog post on creating meaningful and effective email campaigns. The app will connect with your published theme. If you’d like to use the app on one of your unpublished themes, you’ll need to publish that theme first. You can enable a password for your published theme if you don’t want it to be visible to the public yet. If you’re using a storefront password, then the app’s style editor will request it from you in order to access your theme. If you’re unsure what your storefront password is, you can find it by going to your Shopify account > Online Store > Preferences. To double check and make sure your account is connected to the right email provider, you can click the ‘Account’ button in the top right of your dashboard. This will bring you to the account settings page, and if you scroll down below the plans, you’ll see the Email Syncing section. Here, you should see a checkmark beside the account you’re connected to!